AA Gill reviewed Salar's Afghan Restaurant in the Calais Jungle. He gave it four stars – apparently the chicken livers were a delight. 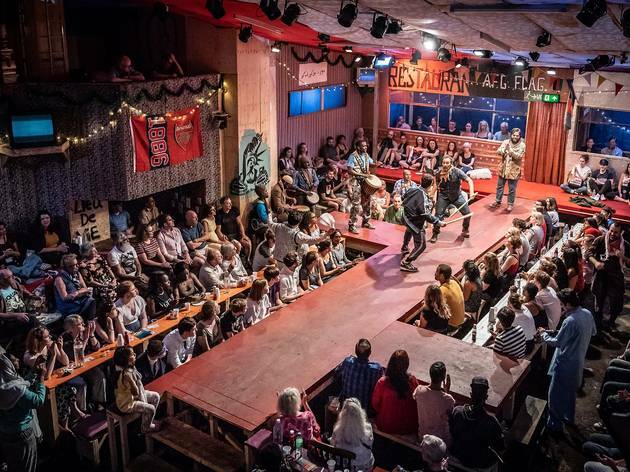 This little nugget of information feels deeply ironic when it pops up in this immersive show – which has transferred from the Young Vic and now fills a West End venue with a meticulous recreation of the restaurant, and its place at the heart of refugee camp life. 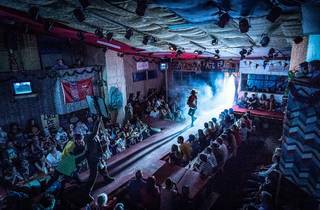 Paying audiences sit at long benches, sip chai tea and get swept up in the fraught energy and unlikely joys of life in the now-demolished refugee encampment. Is it voyeuristic? Yes. 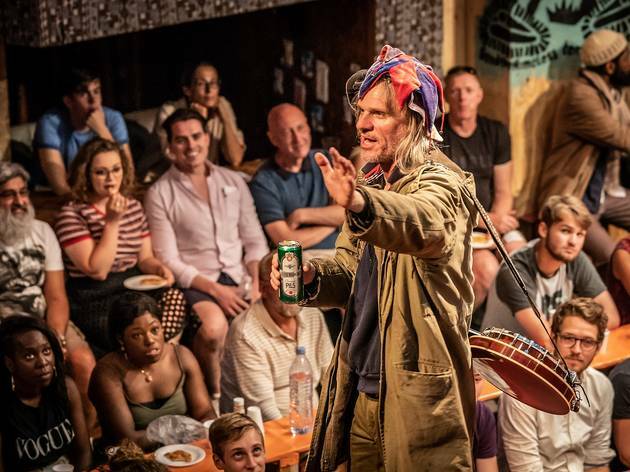 But it's also an intelligent satire of how the Calais Jungle became, for its year in existence, a kind of repository for the utopian scheming, hapless curiosity, adventurous instincts and need for escape of the many British people who flocked there to ‘help’. Directors Stephen Daldry and Justin Martin create a vivid sense of all the communities living side by side in this small, densely-inhabited patch of French ground, all narrated by wise, accidental leader Safi (Ammar Haj Ahmad). There's Salar and his restaurant, a recreation of his beloved lost business in Kabul. A gaggle of teenage boys who spend their nights (like everyone else in the camp) trying desperately to stow away in a car or lorry to cross the border, and their days at an English school run by Beth, a well-meaning 18-year-old from the Home Counties. Eritrean Christians - who run both a chapel, and a nightclub where British volunteers get sloshed. And the brattish, but terrifyingly efficient Sam (Alex Lawther), who spends every waking hour mapping the site and building houses: the colonial resonances aren't lost in co-authors Joe Murphy and Joe Robertson's intricate, knowing play. Not to be that person, but I did – in between the exhilarating scenes of fevered dancing, singing and drumming, in between the desperate factional squabbles and tense struggles and heartbreaking stories – feel a level of discomfort with the fact that this whole spectacle was engineered by two white writers, and two white directors. It's a show that zooms in on British people’s flawed attempts to make sense of a crisis that’s at least partly of their own government’s making. But it also uses mawkish devices that feel calculated to get a British audience to react in a certain way. Like the singing of carols, and ‘Jerusalem’, the explication-heavy passages where refugees tell white volunteers about their experiences, and the often-mawkish use of a cute little girl refugee to hammer the pathos home. It's a show that centres universality over difference and foreignness. Like a restaurant does, I guess, by bringing different cultures to the same table. 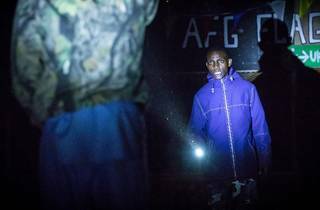 Where ‘The Jungle’ shines is in showing the clash of world-building optimism and utter desperation behind this contested, now lost patch of Calais: but perhaps its determined comprehensiveness means that these refugees’ individual, painful narratives are blurred into one cry of pain. So many words are applicable to this astonishing piece of theatre- visceral, shocking, heartbreaking, heartwarming, thrilling, scary & jaw dropping. Based on real events this tells of the genesis & destruction of the refugee camp The Jungle in Calais. It weaves the stories of the desperate souls drawn there & the volunteers who try & support them (the source of much of the much needed moments of humour & light relief). The cast are incredible & give their characters such humanity & dignity. The whole theatre has been transformed & the set is integral to the authenticity of this unique piece. This is heavy subject matter & an emotional rollercoaster but truly an unmissable play. Genuinely one of the most affecting works I’ve ever been privileged to watch. When we finally get to the stories of the refugees, this show shines. Their stories are genuinely moving and powerfully performed. 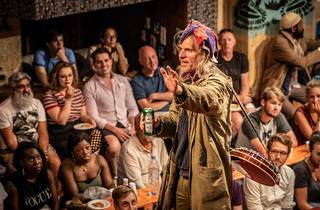 The problem with the play is that is spends way too much time (almost the entire first act) on the White Saviours, succeeding only in reinforcing stereotypes and showing only unfelt, patronising relationships with the refugees. I'd recommend the play, just bear with the first act... they will get to the more truthful work in the second act when the British show-pony characters take a back seat. This is the kind of play that stays with you. 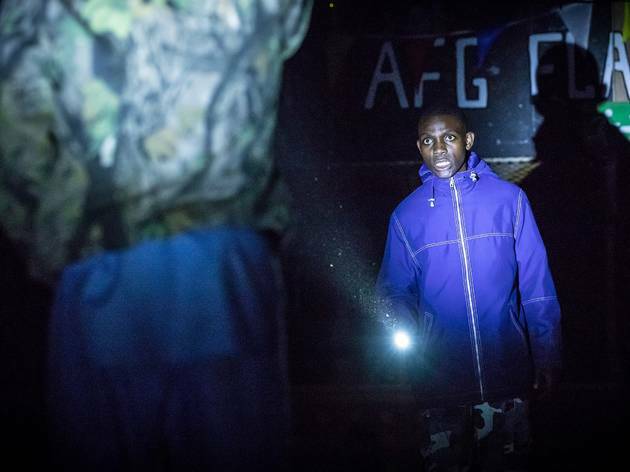 Set in Calais' 'Jungle,' the action tracks the relationships of both resident refugees, and British volunteers trying to help them. The action switches between humour, song, and brutal moments of violence that utterly break your heart. 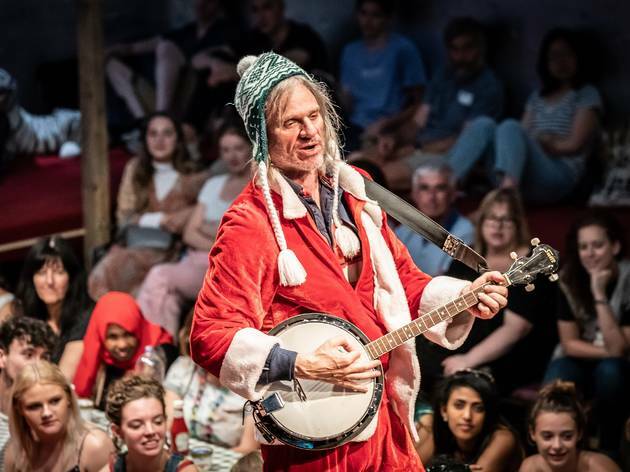 The cast are devastatingly talented, and the clever use of an immersive setting means that, as an audience member, you are fully committed to the world of the play. 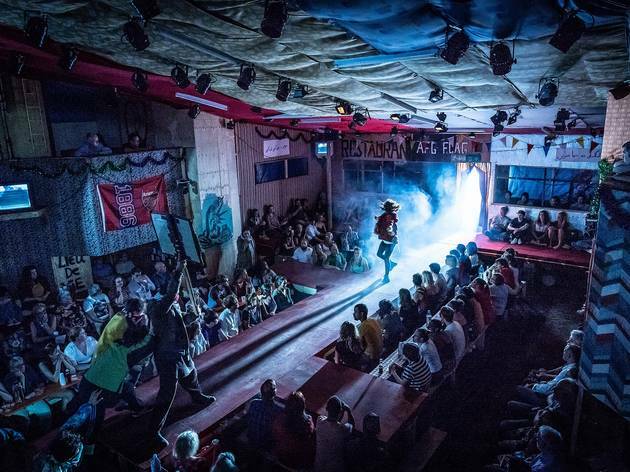 The Jungle is a stunning bit of theatre: it gets into your heart and soul, makes you question the things we take for granted - home, safety - and leaves you shaken. Very powerful & moving history of the Calais "Jungle". I challenge you not to be disturbed by the experience. 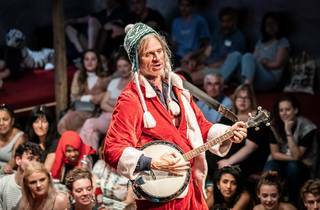 This production @ the Young Vic has sold out, but I guarantee it will be transferred to another venue. It's too important not to be seen by a wider audience. 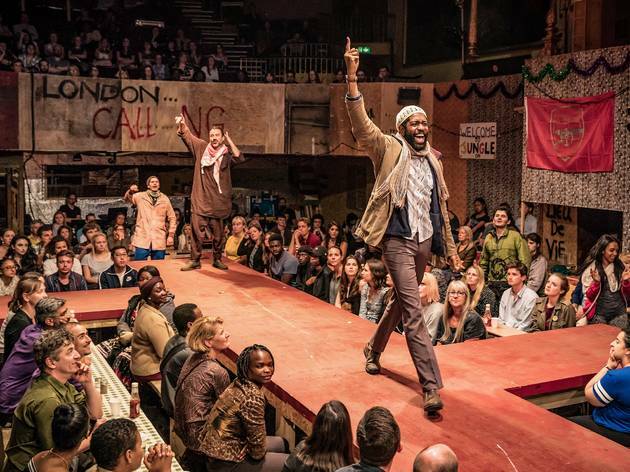 I attend theatres to be educated as well as entertained and this innovative play did both. News bulletins have given us much of the background stories of refugees in "The Jungle", Calais, but what of their day-to-day existence, the internal squabbles, the attitude of the local community towards these "intruders and the lack of empathy and bullying from governments? We hear about it all. 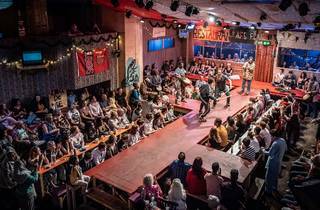 The actors strutting around the whole space where sits the audience,around long tables and on floor cushions. There are moments of humour giving light relief, voices are well projected and the 2 hours 45 minutes of theatre passes quickly. A play to look back on often and reflect. This is a very profound, thought provoking piece of theatre. I sat in the dress circle or 'Cliffs of Dover' as it's called, but could still hear and see most of the action. I learnt a lot about the Calais 'Jungle' and got a feel for the types of characters that lived there. 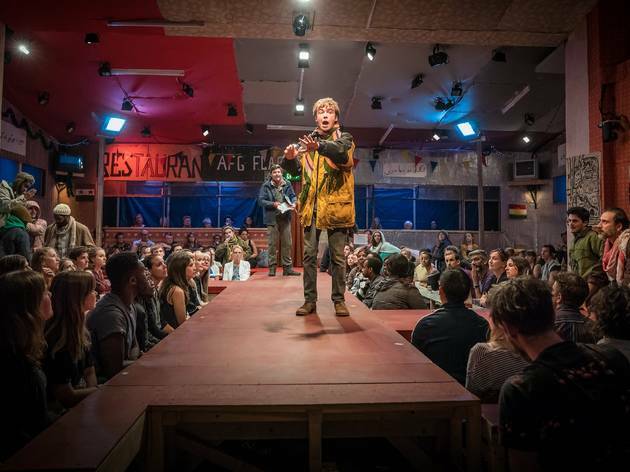 The acting is first rate and completely believable, I did feel at times as if I was a member of the camp. One of the most profound, moving, questioning plays I have ever seen. People have been saying it's the play of the decade - I agree. It doesn't give any easy answers, and leaves you thinking for days, weeks, months about what the world can and should be doing in the face of what is called the 'refugee crisis'. It's also incredibly acted - you are with the characters every step of the way, you truly are inside the Afghan cafe thanks to the amazing set. I defy anyone who sees it not to leave changed. One of the most touching plays in London theatre scene at the moment! 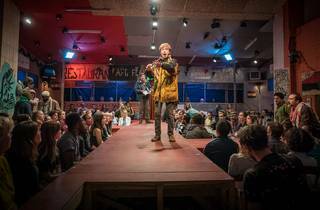 Stephen Daldry and Justin Martin has masterfully directed this play, transferring the audience to a small cafe/restaurant in the Calais refugee camp. All actors are amazing, with Alex Lawther having the Sam's role and being stunning as usual. 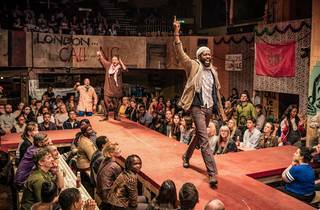 The Jungle refers to the refugee crisis with a unique way, that makes this play an absolute must-see for everyone.